Whenever I pass by those quaint cigar cafes, the smell of coffee and cigar sometimes bring back a flood of memories from my childhood back in Bacolod City. I remember tagging along my father or my grandfather on Sunday mornings to a coffee house where they would meet with their friends to chat over cups of coffee. I would sit with them in a long table having hot milk and steamed rice cake ("puto" in our dialect) with cheese while listening to their chats. My father and grandfather were not cigar smokers but I saw a lot of elderly men in the coffee house smoking those fat, brown, aromatic cigars. Here in Florida where we have a large population of South Americans and Cubans, one can see a lot of cigar stores and cafes carrying a wide array of cigars (and cigarillos). I thought then that cigars were only smoked by elderly men because I never saw young men smoking cigars. 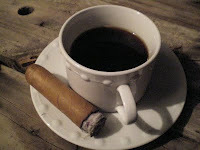 Here, when ever I walk pass by those cigar cafes, I see men in their twenties smoking a cigar while having a cup of coffee or a glass of wine. Acid cigars are said to be popular among that crowd because of their taste and aroma which range from the mildest to the most intense.